Charles E. Holman Morgellons Disease Foundation announces a new study that shows Morgellons disease is not a delusion. Review of medical literature exposes flaws in delusional description. Embedded cutaneous blue and white filaments @ 50X magnification. This paper shows that most studies of Morgellons disease are appreciably flawed, and the disease does not meet criteria for a delusional disorder in accordance with the guidelines of the APA,” said Casey-Holman. When does a “delusion” become reality? That question is addressed in the review paper entitled "History of Morgellons Disease: From Delusion to Definition” written by microbiologist Marianne Middelveen from Calgary, Canada, together with nurse practitioner Melissa Fesler and internist Raphael Stricker, MD from Union Square Medical Associates in San Francisco, CA. Morgellons disease is a bizarre skin condition associated with tickborne disease. It is characterized by disfiguring skin lesions containing multicolored filaments, often accompanied by fatigue, joint and muscle pain and neurological problems. 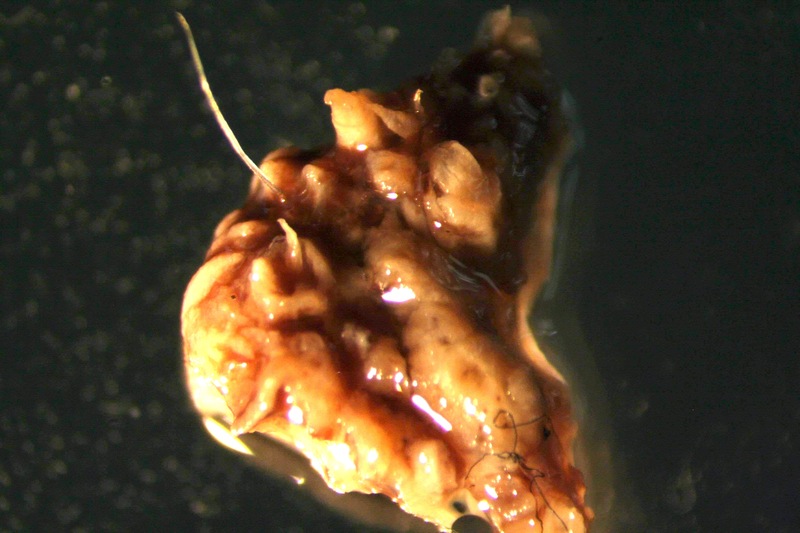 Morgellons disease is a controversial topic in medicine. The controversy surrounding this dermatological condition is explored in the February 2018 report published in the prestigious medical journal Clinical Cosmetic and Investigational Dermatology (https://doi.org/10.2147/CCID.S152343). “This paper compares the evidence of an infectious etiology for Morgellons disease to the evidence that it is a purely delusional illness," says Cindy Casey-Holman, director of the Charles E. Holman Morgellons Disease Foundation (CEHMDF) of Austin, TX. To be diagnosed with a delusional disorder according to the guidelines of the American Psychiatric Association (APA), a patient’s symptoms must meet specific criteria. "This paper shows that most studies of Morgellons disease are appreciably flawed, and the disease does not meet criteria for a delusional disorder in accordance with the guidelines of the APA,” said Casey-Holman. The CEHMDF has funded a number of research studies illuminating the origin of the colorful skin filaments and showing that Morgellons pathology is the result of an infection. Some mainstream medical practitioners claim that the microscopic colorful fibers are self-implanted textile fibers, or that patients think they are infested by bugs or worms. 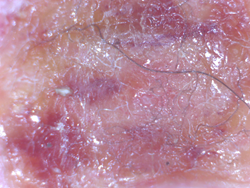 In fact the fibers found in Morgellons skin lesions are not textile fibers, nor are they bugs or worms. They are human biofibers composed of the proteins collagen and keratin and produced by skin cells. While the blue coloration is caused by melanin pigmentation, the cause of red coloration remains a mystery. “Many doctors are reluctant to accept evidence that challenges the status quo,” says Casey-Holman. "We need doctors to objectively examine all the evidence, so that patients can get treated for the underlying infection." “Morgellons is not a mystery. A plausible explanation is supported by scientific evidence. The fibers are human structural proteins,” explains Fesler. “It results from an aberrant response to the presence of tickborne pathogens.” The study also highlights the presence of brain scan lesions in some Morgellons patients, confirming the non-delusional nature of the disease. Thickened keratin projections and threadlike filament. Thickened keratinized follicular casts growing inward into the dermis. Note the clear inward growing hair. 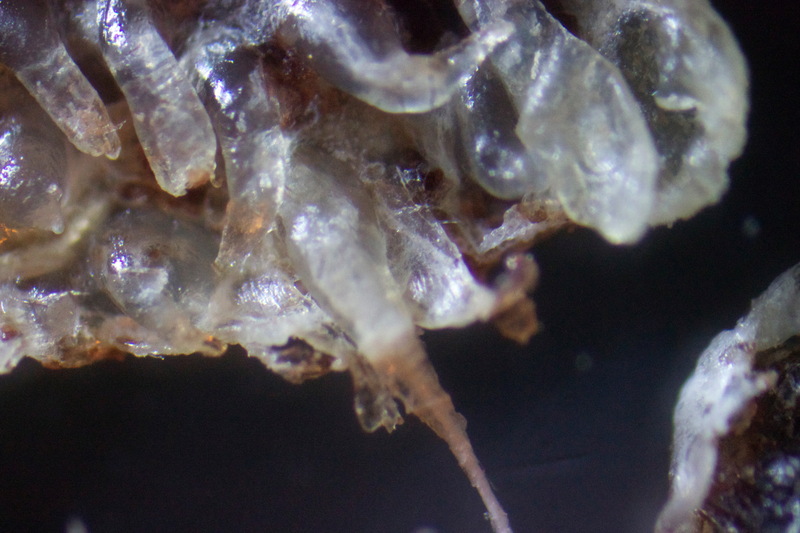 Filaments remain embedded in deeper layers of skin after removal of a callus ( 100X magnification).